released on April 1st 2019. Asst Commandant 02/2019 Group V & VI Result Released download here. 7 vacancies for safaiwala (1oth pass last date 12/3/2019 (offline) notification here. 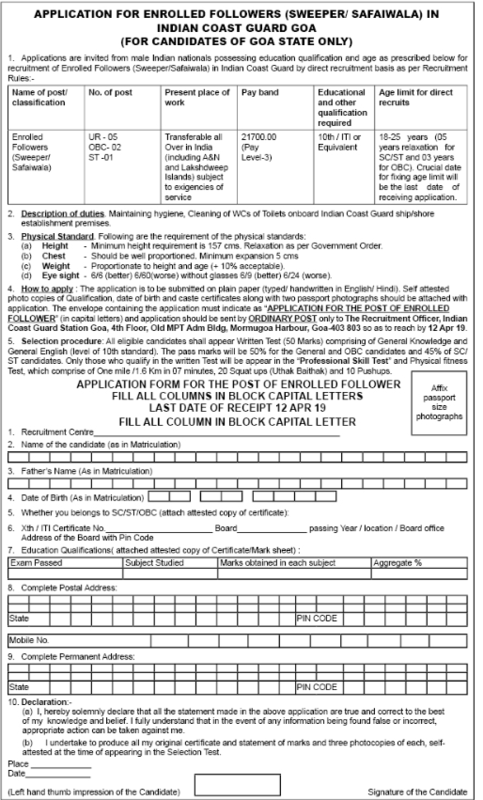 Indian coast guard (ICG) has published notification for the yantrik vacancies. Interested & eligible candidates can read Notification & Apply online before the last date at http://joinindiancoastguard.gov.in/. Short details: Indian Coast Guard Recruitment 2018, INDIAN COAST GUARD has published notification Foreman 18 vacancies. Interested and eligible candidates can read Notification and Apply online before last date http://joinindiancoastguard.gov.in/. Admit Card download: To download the Foreman admit card, visit http://joinindiancoastguard.gov.in//, and enter the hall ticket details to view exam date. To know the Results: Indian Coast Guard Recruitment 2018 Results will be available few days after exam date, on UPSC’s website.